[Lagos] 1 March, 2018 — Today, Google announced a new job Search experience that aims to help job seekers find employment opportunities. For the first time, when someone uses their phone or computer to search on Google for a job, they will see a streamlined experience letting them explore, research and find relevant, local job postings. This launch builds on Google's existing commitment in Sub Saharan Africa to improve economic opportunities for job seekers and employers, demonstrated through its Grow with Google initiatives. The Digital Skills for Africa program, Google's commitment to train 1m African youth between April 2016 and March 2017, was achieved and surpassed. In July 2017 this program was extended to see 10m youth trained by 2022 as well as 100,000 developers trained across the region. Users will able to view at-a-glance details about the posting, such as job title, location, whether it’s full-time, part-time or an internship, as well as detailed information should a job be of interest. Using Google Maps integration, job seekers can search for jobs any place they can find on the map, and if they’re signed in, they can even see how long it would take to commute to the job from home. As this is an open ecosystem, Google is inviting all job sites, platforms and employers -- big and small -- to integrate with us and make their jobs eligible to display in the new jobs search experience. With Google’s newly released open documentation, any jobs provider is able to integrate its content through open structured schema.org web markup standards Google supports. 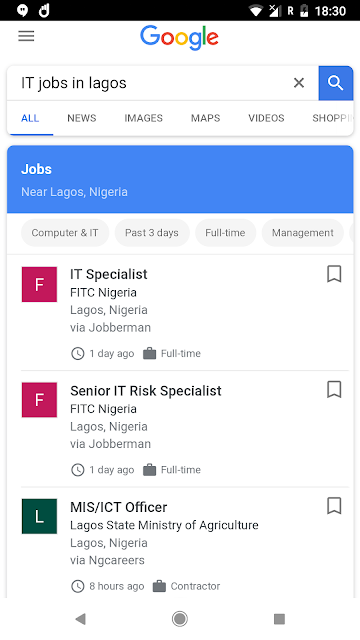 To optimise the feature and make it more useful, Google is working with a broad and growing cross-section of partners, such as the Federal Government, Jobberman, NGCareers, MyJobMag and other job resource websites in Nigeria. These collaborations ensure Google is able to present job postings content accurately, as soon as it is posted, to exactly the people that will find it most relevant. In addition to its Digital Skills initiative and the new jobs Search experience, Google also supports tech startups at various stages of their lifecycle through the Launchpad program. Announced last year, Launchpad Accelerator Africa will provide over $3 million in equity-free funding, mentorship, working space and access to expert advisers to over 60 African startups over 3 years. Intensive 3-month programs, held twice per year, will run out of a new Google Launchpad Space in Lagos - the program’s first location outside of the United States.